Sir Edwin Landseer (1802-1873) was a famous English animal painter. 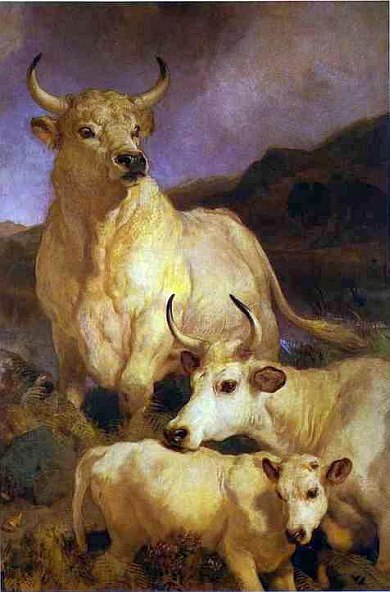 The Wild Cattle of Chillingham was painted in 1867 and includes a magnificent bull, accompanied by a cow and her calf. This painting and a companion picture entitled Deer in Chillingham Park” were commissioned to be displayed in a chamber at Chillingham Castle, the seat of the Earl of Tankerville. To learn more about the artist and see additional examples of his work, please visit our biography of Edwin Landseer.